What with this, that and, of course, the other thing it has been a very busy week. Only match reports to keep everyone current. We have reached the point of the season where playoff games will be scheduled and they are often listed as “Pacific Northwest #2 v Northern California #1” or, on a Sunday, “Winner Match 4 v Winner Match 7”. Please make sure to include the team names in your writeup and a clue as to who scored what so I can record them properly. Many thanks to Paul Bretz who did that very thing with his report this week. The match took place directly after the Harvard Women’s Varsity 7’s Tournament, which was decidedly won by Army over Harvard in the final. Mignone Field is definitely a jewel for New England. Dedicated World Rugby approved turf rugby field, sky high goal posts and plentiful bleachers. This setup rivals anything else in college rugby (I’m looking at you Cal and Stanford). This was the first spring season match for both teams, so it was treated as a live fire scrimmage. Although once the whistle blew to start the match, it felt much more alive than just shaking off the winter cobwebs. Breakdowns were a bit messy with Harvard doing most of the infringing. Off-side and off the feet at the ruck were the favorite penalties. A few quick penalties and a conversation helped put the whistle back in my pocket. Harvard’s backs really took the match. They had better ball handling and more of a game plan once they had the ball. One Harvard back managed two yellow cards (for a red to complete the color wheel), including a high tackle/penalty try. That’s how you work out the cobwebs, I guess. Many thanks to Amelia and Marty who rant AR for me after running all day at the 7’s tournament. And a big thanks to Nick Eldred for hosting me for the night. The pizza was excellent! Another beautiful weekend out at Witter Rugby Field. I had been expecting rain all week for my Saturday match, but miraculously, the weather cleared, and we were luck enough to be able to play in warm, sunny weather, rather than cold and rainy. Dartmouth came out and scored first, kicking a penalty goal after winning a couple of not releasing penalties on Cal. Cal quickly added a try, missed the conversion, and then added two more tries before Dartmouth was able to take advantage of a Cal knock-on at midfield and run it back for a try. Dartmouth went on to capitalize on another Cal mistake during the half and was able to go into half only down 51-17. In the second half, Cal’s dominance, as well as maybe Dartmouth’s lack of gamete fitness, certainly showed. On at least 2 occasions, Cal was able to score a quick try off of a kickoff, and then immediately put another try on the board following. Dartmouth was able to score one more try in the match thanks to another Cal mistake, and a great run through one or two tackles by their replacement #22. The other Dartmouth score came from a penalty try about 10 minutes into the second half. A Cal player, who we were unable to identify in the moment, made a high tackle on the Dartmouth winger in his attempt to score a try in the corner. 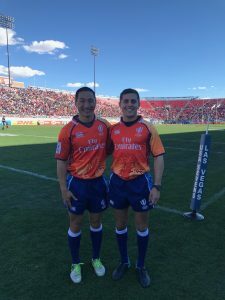 Both Grant and I were in agreement about the penalty try, but because of the odd angle of the tackler, neither of us were able to get a number, and in the unpinning of bodies, we couldn’t properly identify the number (An error that I am going to work on correcting for the rest of the season and into 7’s). Cal was able to add 50 more points in the half, at times making their big 60 meter runs to the try-line look easy. All told, Cal easily won the match 101-31. Fun end of season match, good spirited, good fun. I was originally scheduled to do Lamorinda vs Solano-Yolo varsity, but for whatever reason, the visitors were not able to field a team and that match was canceled on Friday. The Lamorinda coaches were able to rearrange a couple of their fixtures, however, and I ended up doing the Lamo-SFGG JV game. I think that was a bit of a treat for both me and the players – I haven’t done a high school JV game for quite some time, and they certainly seemed happy to see me. Having said that, I almost didn’t make it do to some kind of protest in downtown San Francisco. I have no idea what those people were mad about last Saturday (as opposed to the previous Saturday, or the one before that, etc. ), but I found myself unable to get my car on the road due to traffic being completely blocked. But BART + Uber got the job done, and I got to the pitch about 45 minutes before kickoff. The game itself was very good, with both obviously well-coached teams looking for attacking opportunities wherever they could be found. The defenses held on both sides, with the first (converted) try not coming until the 23rd minute for SFGG. Lamo responded with their only try of the day at 29′ to pull within 2 points at 7-5. SFGG added one more at the very end of the first half to lead 12-5, which was a pretty close reflection of the contest. I found the JV players to be gradually, but gladly receptive to my game management approach, which really helped the game flow. Clearly, neither side had seen much in the way of referees managing a game before, but I was really happy to hear that each side had several players certified as L1 refs (a few of whom are already reffing their own games). This portends well for our future rugby competitions here. One hint for any younger or less experienced players out there: it doesn’t do your team any good to be yelling at any level of referee for a penalty if he’s standing 10 feet away and already has his arm out pointing towards your side – i.e. playing advantage for your team for the offense you’re complaining about. As in this game, that will always lead to an immediate game stoppage followed by some firm and direct verbal feedback. In other games, especially more senior ones, you will almost certainly get penalized, and perhaps yellow carded as well. Back to the match: the second half was not one-way traffic at all, but SFGG did score the only points of that half with a converted try 7′ in. Their larger bench probably helped. A SFGG player went to the bin at 24′ for a high tackle, but they followed up with another try at 34′ while still one man down to lead 24-5. The last score of the game, at 39′ (running time, due to an injury), was a penalty try to SFGG. This came from a touchline Lamo high tackle that earned the player a yellow card. The ball carrier was perhaps 30m from scoring at that point, but the high tackle also came from the last defender, hence the decision. Thanks to both teams for a great game, to the touch judges, to the Lamo coaching staff for reorganizing this fixture at short notice, and to my former O Club teammate Mateo for dropping me back at BART so I could get home. Upon exiting my car the air was frigid with snow clouds forming not far away. The high school football field in the Sierra Foothills was a 3hr drive for the Marin team, 2.5 for me and I had a moment to both enjoy the breadth of rugby in Northern California and also appreciation for the all the away travel that Mother Lode must do plus other teams that travel a lot to play. This was a super game of clean, fast, tight varsity high school rugby of a good standard. Clearly two well drilled and coached teams. Marin had superiority in the scrums, otherwise there was parity in most other areas. Mother Lode scored early off some tight forward running, pick and drives close to the ruck, which helped them progress up the field. The try was converted. 7-0 From there, it was an arm wrestle with possession going back and forward due to dropped ball, at speed. Following a high & long Mother Lode punt deep into the opposition half, there was some deft passing by the Marin backs and their winger scored after a burst down the side, at speed. The try was converted 7-7 and the scores stayed that way for the rest of the half. The second half was similar with both team running hard at each other, with some skillful moves and an appropriate level of intensity for two teams equal on the scoreboard. Around the 12 min mark, a penalty against Marin and successful PG took Mother Lode into the lead, 10-7. Ten minutes later another PG from 40m out and Mother Lode were up 13-7. Marin then lifted their intensity and Mother Lode matched it. Marin had a lot of ball in the final 15 minutes, plus were a man up due to yellow card (high tackle) yet knocked it on during several plays, in the Mother Lode half. While the players seemed frustrated, they kept at it, attacking and trying to find a way through the Mother Lode defense, to no avail. Hats off to both teams – great skill and attitude with good old rugby camaraderie and culture on display afterward. It was a beautiful day for some rugby at Cal Maritime for the NSCRO Regional Playoffs. After some pre-match complications of all sorts including an unfortunate last minute drop out by CSU Monterey Bay, then being replaced by UOP, and then a slightly delayed kickoff time, we were finally underway! The visiting Mira Costa College from San Diego came out with a solid Sipi Tau prior to kickoff which was awesome. Once the whistle blew, it was all MCC the overwhelming majority of the game. They came out strong and stayed fairly consistent with their attack, dotting down multiple tries. UOP was in the mix fighting hard at each play, but losing a bit of shape as the phases ticked on, creating the space for MCC to get through. However, midway through the second half UOP got a sweet 7 points off a brilliant play from their winger. They actually had just turned the ball over deep in their 22m and now they were down in the attacking 22m from some kicks forward, as the chase was on one of the MCC players grabbed the shirt of the UOP winger preventing him from scoring. After a short consult with my AR, a penalty try was awarded along with a yellow card for the grab. There were some lovely conversions taken from the MCC kicker as well, easily PRP level kicks, with one being scored from the outside and getting a nice bend around and in the posts. All things considering including the scoreline, the game was very well contested and I was happy to see the last minute UOP side come out with some good fight in them. Thank you to both UOP and MCC for a lovely match with respectful players and coaches, and many thanks to my wonderful AR’s Scott Wood and Giles Wilson for their assistance during this match. One of the more competitive matches I had this season. The match was played in Fernley about 30 minutes east of Reno so even the home team had a bit of a drive. It didn’t look promising for Reno as players straggled in. Only about a dozen were on hand for warm up. The coach kitted up to play and his 15th player showed up 10 minutes before kick-off. Meanwhile, Fog showed up early, in good numbers and had a sharp pre-game prep. Once the match began, none of that seemed to matter mattered. Reno jumped out with two early tries, seemingly catching the Fog backline unprepared. Reno kept the pressure on with strong attacks and stout defense. A few more regulars showed up and the coach retired to the sidelines. Even when Reno played short because of sanctions, Fog couldn’t capitalize. The second half saw a more aggressive SF team and their disciplined approach rallied to tie the match 33-33 with about 10 minutes left. Reno made another solid attack to give them a go-ahead try and conversion. With time expired, Fog was advancing and threatening to at least even the score but possession was lost, Reno kicked to touch and it was over. It was a beautiful day for rugby at For Pete’s Sake field in Santa Rosa. Both teams came out with good energy and good spirits. Santa Rosa controlled the first 15 minutes of play, leading 10-0 halfway through the period. shortly after the 20-minute mark San Jose started to click with a relentless kick-heavy attack that included a brilliant chase and score by their #14 who barely outraced two Rosa defenders for the ball and then accelerated away for an outstanding try. At half time the Seahawks led 10-26. The second half saw the teams trade tries. San Jose’s first try of the half saw another spectacular kick/chase that caught 29 of the 31 people on the field by surprise. San Jose took a penalty kick near midfield and looked like they were going for touch. It looked like the ball would be caught by the defending wing, when Rosa’s own winger materialized as if out of nowhere, leapt, gathered, and took off for a score cutting the Seahawk lead to 15-30. Santa Rosa would score on more gritty try at 39:45 and nearly took the ball across for another score off of several phases from the ensuing kickoff. Special mention goes to the San Jose #15 who had several long scores and made all but one of his conversions. I also want to recognize both teams’ captains and coaching staffs for their leadership. Despite one or two potential flash points, both teams played the game in the spirit of rugby exactly the way we imagine it. Refereeing is easier and much more fun when the players have the focus displayed both both sides in this match. A back and forth match that was evenly played throughout. Neither team had a lot of subs, but played tough for the entire match. Silverhawks scored first, Rosa converted two tries for a 14-5 lead. Then it was 19-17 before Rosa scored again. Faded Roses ended up with a higher point total at 31-24. Silicon Valley hosted Fresno in East Palo Alto at Rich May Field. This was my first time seeing the new all turf field built in memory of Rich May, Frank Merrill’s son in law who was killed in the line of action as an East Palo Alto police officer. The field is lined for rugby, with a shed full of goal pads, cones and scrum sled. Very nice memory..thanks Frank. OK rugby. I had refereed both teams earlier in the season and both looked improved. Silicon Valley missed an early penalty to gain the first lead. Fresno scored first at 18 minutes. Fresno was better on this day but this was a very competitive game, played by two good D-3 teams. Fresno traveled with sixteen players including their 51 year old player coach, Rodger. Rodger started at #8 and looked to organize the Fresno pack. This led to two more try’s and Rodger converted all kicks for a 24-3 half time lead. Fresno substituted Rodger at half time and there organization suffered. Second half score Silicon Valley 15 Fresno 14. Silicon Valley may have won the second half but all 80 minutes count. Final score Fresno 38 Silicon Valley 18. Well played guys good luck for the rest of the season. Saturday marked the 50th anniversary of the founding of the UCSC rugby club. Many members including some of the original first 15 were on hand to watch their former club go up against Stanford. Thankfully the rains spared the match and the conditions were pristine except one of the four goal posts was a little shorter than his brothers. No matter. Stanford had been ravaged by injury since I last saw them. Many new faces dotted the field. Coupled with the home side playing in front of a big, alumni filled crowd. The day was to be sluggy. Both teams played with consistency. Hard and physical game that got the home fans up in arms and cheering. A great game by all participants. Good luck to both in playoffs. Sunday’s NSCRO pool finals hosted by Cal Maritime pitted Humboldt against Mira Costa from Oceanside. As happens during playoffs, team that win move on and those that don’t conclude their seasons. Mira Costa appeared to be the more dominant side initially as they jumped to an early lead and seemed to be pulling away from Humboldt. However, Humboldt was able to adjust their play and managed to close the deficit built on in the first half and score 17 of their 22 points in the second half. The game was as enjoyable to officiate as it was to watch by all accounts of the fans who witnessed the competition. 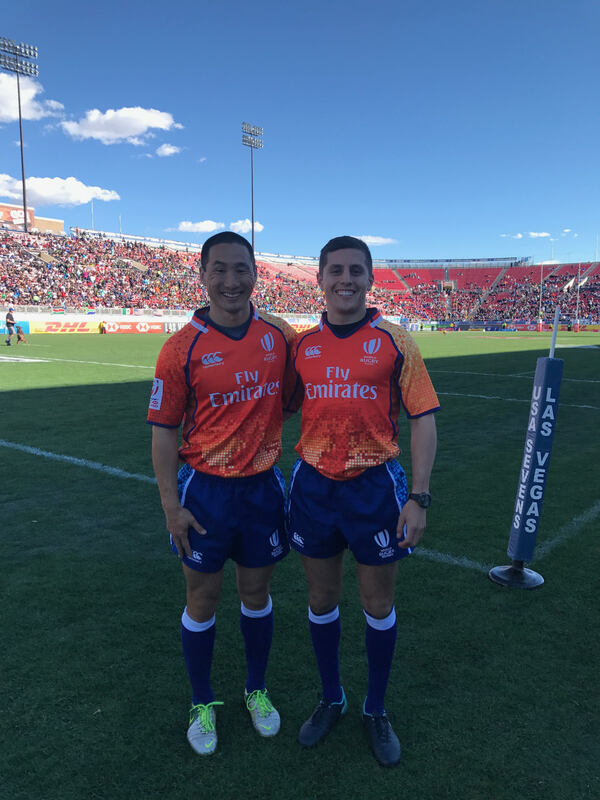 The Unknown Pelican poses with Pelicus Parvus Scurra in their World Rugby kit at the Vegas 7s. This entry was posted in News on March 29, 2018 by James Hinkin.